The index opened strong but saw huge profit booking from the onset to move to the lows around 7447, where buying emerged but could close only at 7486.15, loss of 45.65 points. The broader market was negative with 659 advances to 881 declines. The range stays at 7000-7700. 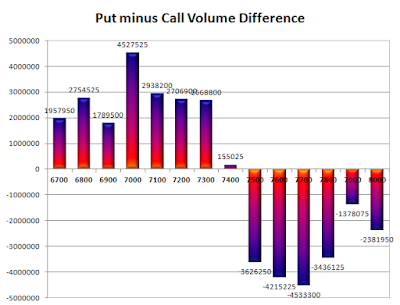 Call option 7400-8000 added huge 14.37 lacs OI with short covering seen at 7300 and below strike prices. Put option 7400, 7200-7000 added 8.01 lacs OI with short covering seen at 7600 and above strike prices. 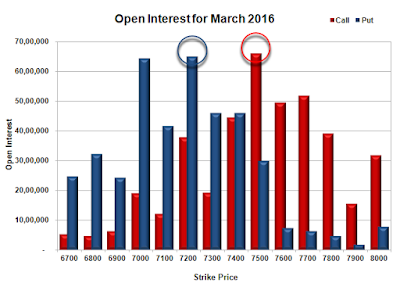 Nifty Open Interest is at 2,17,83,675 down by 8,02,200, with decrease in price, most probably huge long liquidation. Bank Nifty Open Interest is at 18,89,640 down by 59,250, with decrease in price, most probably long liquidation. FII’s sold 0.20 lacs Futures, which includes net 6504 contracts long liquidation and 5696 contracts short covering, with decrease in net OI by 12200 contracts, includes 25640 longs to 26448 shorts for the day. FII’s Index future open contract as on date is 161084 Longs to 136121 Shorts, Net 24963 down by 808 contracts. 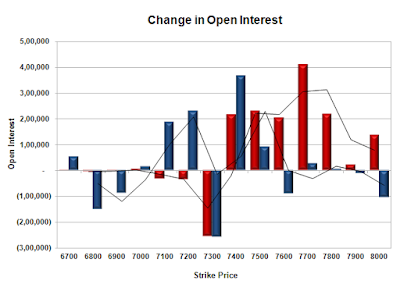 Initial support stays at 7400, with OI of 46.11 lacs and below that at 7300 with OI of 46.07 lacs. 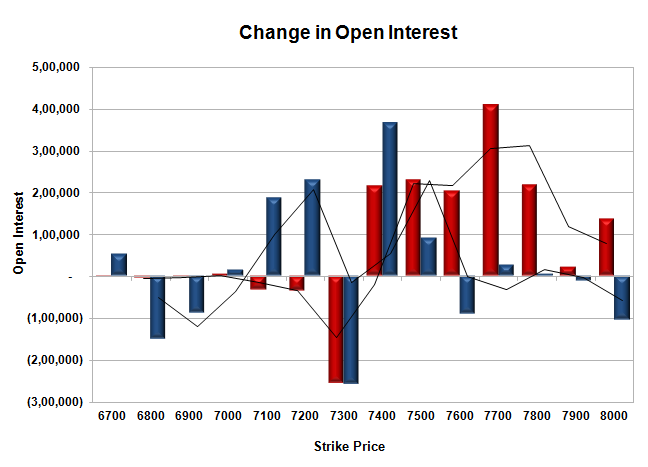 Initial and best resistance at 7500, with highest OI of 66.14 lacs and above that at 7600 with OI of 49.63 lacs. Day Range as per Option Table is 7402 - 7579 and as per VIX is 7416 - 7556 with 7494 as the Pivot.